Annie has a Diploma in Fine Art and Printmaking from The Ruth Prowse Art School where she studied under Eric Laubscher and Jonathan Comerford. She has complimentary qualifications in Clinical Hypno -Therapy, and other healing modalities and has worked with Death and Dying for many years. This often unspoken aspect of life, its delicacy, fragility, the beauty of decay and the ethos surrounding our human-ness (being human) is a constant presence in her art as is the transient and ephemeral nature of things. In 2014 she exhibited as part of FLOW – a local art event at the Whitehouse Venue & Theatre in Plettenberg. 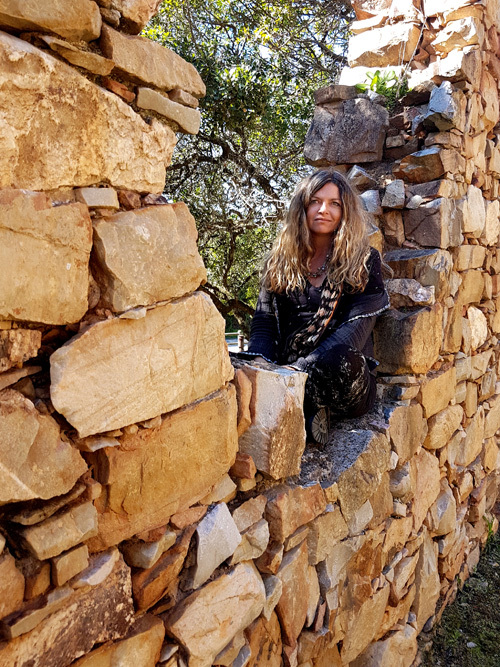 She has been involved with the Site_Specific Land Art Biennale in Plettenberg Bay, and Stories of Rain – the South African leg of the Global Nomadic Art Project. Annie were also on hand for The Mantis project in the Tankwa for the 2015 Afrikaburn – helping to construct the Mantis with the Elandsvlei community – and she is an active contributor of Afrikaburn’s Outreach project. Annie recently participated in The Grand IV at Rust-en-Vrede Gallery in Cape Town, and is currently creating work for VERGE – an upcoming exhibition hosted by the Knysna Gallery in the Old Gaol museum in Knysna, South Africa, from 10-30 November 2018.